This lovely seaside resort is the place where lots of Europeans head for in the summer to have fun in the sand, the sea and the sun. It is the biggest and most universal seaside resort in all of Lithuania. Its beaches are known for their amazing white sand and dunes. 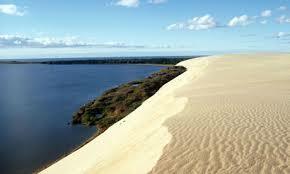 The sandy coastline stretches for more than 10 kilometres with a pine forest in the background. Palanga dates back to the 12th century and was once a simple fishermen’s village. It was also the place from which residents gathered golden amber which then was taken along merchants’ sea routes to other countries in Asia and Europe. Palanga started becoming a health resort in the 19th century during the dynasty of Count Tyszkiewicz who made the town his home. In 1899 author A. Keturakis made Palanga the scene of his play “Amerika pirtyje” or “America in the Bath” which was the first national play in Lithuania. The seaside resort has become very popular and tourist can find lots of entertainment and activity. There are many pubs, cafes, restaurants, discos, night clubs and casinos. When you’re on holiday you can try out pedal boats, bikes, go horse-riding, and play tennis among other choices. For your health you can go through a complex of baths. Taking a break from the beach you can visit the lovely landscape park Birute Park. It was founded in 1987 by Count Tyszkiewicz and at that time surrounded his palace. You can see the palace sitting between a pond and the legendary hill of Birute which at one time was an ancient Lithuanian sacred place. From here you can have fantastic views of the sea. It is lovely to stroll here among little paths and squares with beautiful flower arrangements created among the trees. The north side of the palace opens up onto an awesome terrace and step lead out into the park. Flowers and a fountain complete this lovely picture. The south side of the palace is surrounded by an oval rose garden. Altogether there are around 500 different kinds of trees and bushes in the park with pine trees dominating. Among the plant species there are about 250 imported and 370 native. Within the park there are eight different buildings, seven sculptures and some other architectural structures. Visitors to Palanga enjoy visiting the Amber Museum which can be found in the Neo-Renaissance palace built by Count Tyszkiewicz. This museum is a branch of the Lithuanian Museum of Fine Arts. Here you’ll find 15 rooms with different kinds of expositions. In the collection there are about 28,000 items. A chapel is attached to the palace which is home to moving exhibitons. An amazing place to visit is the Dog Museum that began with just one ceramic dog. It now has a collection of more than 3,500 souvenir dogs made out of 25 different kinds of materials and origination from about 42 countries. They feature everything from dog-shaped earrings to soft and plush stuffed doggies. This is the only Dog Museum of its kind in the Baltics. Two other places to explore are Anaiciai Ethnographic Cemetery where you can find a collection of 19th and early 20th century graves with various intrinsic detail and the Sculptures Garden offers 28 contemporary art statues by artists from Armenia, Estonia, Latvia, Lithuania and the Ukraine. Palanga offers a whole lot more but of course the main reason to come to the resort is for its beaches in the summer time when there is a carnival feel in the air. During the season the place to be is on Jonas Basanavicius Street the only pedestrian street here and anything that has to do with entertainment goes. You’ll find lots of restaurants, bars, rides and other kinds of attractions.